Typically, we feel most at risk of an accident with a large truck while passing a tractor-trailer, or when a big rig is coming up fast from behind. However, our Atlanta trucking accident attorneys know a significant number of serious and fatal accidents involving tractor-trailers result from a motorist slamming into a truck from behind. Traveling behind a truck often blocks the view of traffic, as well as traffic signals. A truck’s large size also makes it difficult to determine how quickly it is slowing. And the risk to motorists is often exacerbated by poorly designed underride guards. These guards are meant to keep a passenger vehicle from traveling beneath a trailer. When they fail, even most 5-star crash tested vehicles perform poorly — leading to decapitation risks for motor-vehicle occupants. A report released in 2011 by the Insurance Institute for Highway Safety found these guards often fail even in low-speed accidents — particularly when a vehicle strikes at an angle. Guards that meet Canada’s more rigorous safety standards did better, but still too often failed to keep a passenger vehicle from traveling beneath the rear of a trailer. It’s a critical safety issue because more than 70 percent of all fatality victims in accidents involving large trucks are the occupants of passenger vehicles. Unfortunately, underride safety issues are not new. IIHS has been reporting on the risks since the 1970s, but so far federal regulators have failed to act. In a recent study of 115 crashes involving passenger vehicles striking tractor-trailers in the rear, only 22 percent experienced no underride. In 23 of 28 fatal accident cases examined, severe or catastrophic underride damage was present in 23 of the crashes. The U.S. Department of Transportation estimates nearly 500 motorists are killed each year and more than 5,000 are injured after rear-ending a large commercial truck. In some cases, these guards are missing. But in many cases the guards simply fail to perform as designed. In still other cases, the guards do not extend across the entire rear of the trailer, making crashes at an angle particularly deadly. Consulting a law firm experienced in handling Georgia trucking accidents is vital in the wake of such a crash. Typically, a motorist who causes a rear-end crash is found at fault. So a thorough review of the facts and circumstances surrounding your accident will be critical. 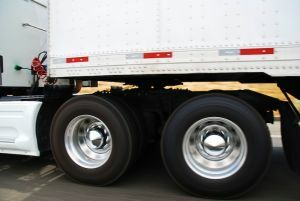 Proving an underride guard was defective may permit you to collect damages from a trucking company, which might otherwise be unavailable for a motorist found at fault in an accident. And, when following a tractor-trailer, remember to do so at a safe distance. If you cannot see a truck driver’s side mirrors, he cannot see you. Riding far enough behind a truck to still see traffic signals and intersection traffic is one way to help prevent these devastating accidents.